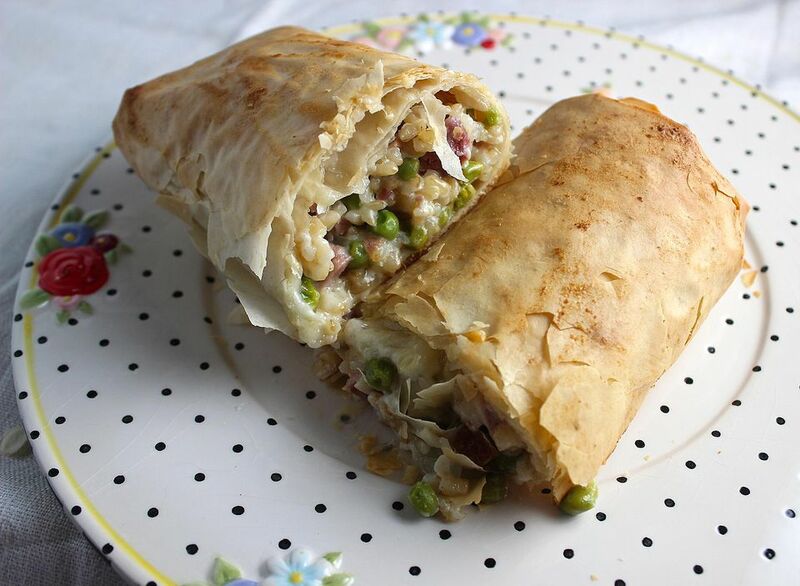 This elegant and beautiful main dish entree recipe for Ham Filo Roll is perfect for Easter brunch or any special brunch. Plus, it's a delicious way to use up leftovers. If you have leftover Easter eggs, chop them up and add them along with the ham. 1. Preheat oven to 375 degrees F. Cook onion and garlic in the olive oil until tender. Add rice and stir to coat. Add the chicken broth, cover pan and simmer for 15-20 minutes until rice is tender. Stir in ham, sour cream, 1/2 cup of the cheese, and asparagus or peas. Set aside. 2. Place one filo sheet on a cookie sheet and brush with butter. Layer five more filo over the first sheet, brushing each with butter. Spread half of the rice and ham mixture over one-third of the stacked filo on the 14" side, leaving a 1 inch border on three sides. Cover with the half of the remaining cheese. 3. Begin to roll up the filo, starting with the long end. You'll only be able to roll the dough over one and a half times; that's okay. Using two spatulas, place on a RIMMED cookie sheet (the butter will melt and make a mess in your oven if you don't used a rimmed sheet). Brush with butter and cut a few slits in the filo roll. Repeat with remaining filo, butter, and filling to make two rolls. 4. At this point you can cover the rolls tightly with plastic wrap and refrigerate up to 8 hours. Add another 8-13 minutes to the baking time if the rolls are baked directly from the refrigerator. 5. Bake for 25 to 35 minutes until the rolls are browned and crisp. Let it stand for 10 minutes before cutting each roll into thirds for serving. The filling is hot!